The Queensland Government has announced that Destination Brisbane Consortium – a group made up of Echo Entertainment, Chow Tai Fook and Far East Consortium has beaten Crown Casino in a bid to develop the lucrative Queens Wharf integrated resort. After over a year of waiting, the decision has finally been called. 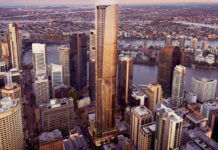 The iconic $2 billion+ project will be built along Brisbane’s North Bank and include the complete revitalisation of seven city grid squares – enveloping Queen, Elizabeth, William, Margaret and Alice Streets. Mooted as the best integrated casino resort precinct in Australia, Brisbane’s economy will also receive a massive injection of 3,000 construction industry related jobs and 8,000+ ongoing jobs in hospitality, gaming and executive level jobs within Echo Entertainment which will be relocating it’s corporate head office to Brisbane. A comprehensive outdoor gym in Waterline Park, located between the waterfront and 1 William Street. A full and extensive range of active recreation facilities such as Nike/Adidas exercise and play equipment, in a contemporary landscape. Heritage restoration of The Mansions (to include an up market tea house, dining, bar and serviced apartments), Harris Terrace (to include an artisan chocolatier, premium stationery & leather goods shop, perfumery and boutique office space), The Printery (to include markets, a gastro pub, cooking school, diamond resorts hotel suites, Former State Library (to include cafe, commercial space and information centre), Commissariat Building, DPI Building (to include a micro brewery, supper club, aboriginal art gallery), Treasury Hotel (to be transformed into a new Ritz Carlton Hotel), The Treasury Building (to be turned into a high end department store and hotel). Brisbane’s newest urban waterfront plaza provides a large, open and highly flexible public events and gathering space. Dispersed throughout the Plaza are a variety of terraced seating areas providing small amphitheatre spaces enabling the Plaza to be fully integrated to host large scale public celebrations, as well as configured for multiple simultaneous localised events. Architectural Showreel from Echo Entertainment Group on Vimeo. All image content and videos supplied by Destination Brisbane (www.destinationbrisbaneconsortium.com.au/).